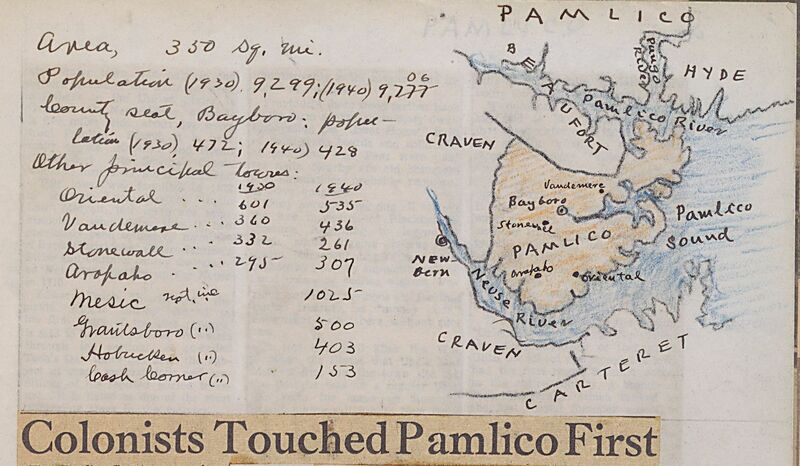 The above map of Pamlico County is one example of the many maps that Francis B. Hays created in his County Scrapbooks, among the newest volumes digitized from Granville County Public Library’s Hays collection. Hays drew a map for each of North Carolina’s 100 counties. The scrapbooks also include population data, historical information, and numerous stories and articles about famous people or events from the county. Hays dedicated a volume specifically to Vance County, Granville County’s next door neighbor. The county scrapbooks are part of a batch of fourteen added to the Francis B. Hays Collection. Mr. Hays was an educator and clerk in Granville County, who dedicated much of his time to documenting the county’s history. These scrapbooks represent Volumes 80-93 of 150 housed at the Granville County Public Library. Aside from the County Volumes, Hays also documented doctors, nurses, and public health in Granville County, indexing names of those working in medical professions. 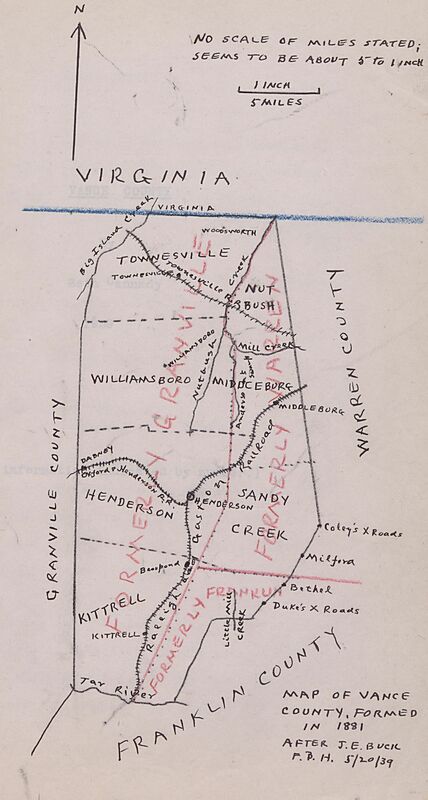 These volumes could be useful for those interested in genealogical research in Granville County and the surrounding areas. This batch also includes two other series of volumes: North Carolina Historical Items and Distinguished North Carolinians. The NC Historical Items series features many articles and clippings that discuss NC during and after the reconstruction era and during the colonial period with information about Native Americans who lived in the state or were removed by the government. The Distinguished North Carolinians series contains articles, clippings, and obituaries of noteworthy men and women connected to the state. Volume 3 of the series may be of particular interest because it contains the most information about noteworthy women, especially authors and poets. You can view all 93 digitized volumes at the Francis B. Hays Collection exhibit page. To learn more about the Granville County Public Library visit their contributor page or the website. Glencoe School in New Bethel Township, Rockingham County; photograph taken in 1980. 200 more slides from Rockingham Community College’s architecture slide collection have been digitized and added to DigitalNC. 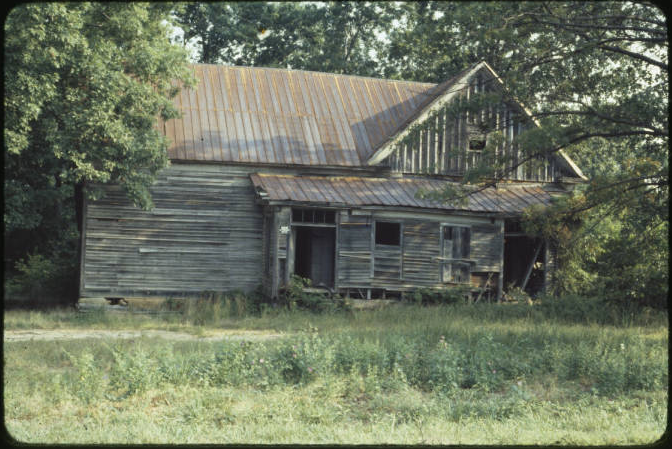 The slides show early architecture around Rockingham County, including houses, barns, farms, schools, banks, mills, and tobacco factories. Taken in the early 1980s, these photographs include multiple exterior as well as interior views of the buildings. Some of buildings still stand today and others no longer exist, but location, owners’ names, and building dates are included in the descriptions of the photographs. You can learn more about these slides and the architecture depicted in the Guide to the Early Rockingham County Architecture Slide Collection. See more from Rockingham Community College on the contributor page and learn more on their website. Witches Club, Presbyterian College for Women, 1910. In celebration of the beginning of Spring, we decided to recreate a favorite yearbook photo at DigitalNC. 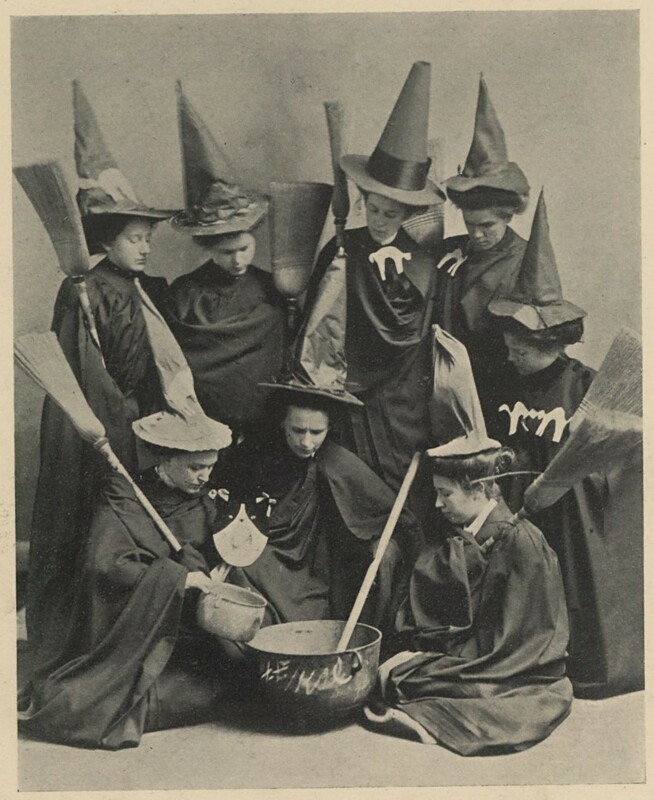 The photograph is of a students’ Witches Club, and it comes from the 1910 yearbook “The Edelweiss,” from the Presbyterian College for Women, a precursor to Queens University of Charlotte. You can read more about it in a past blog post. 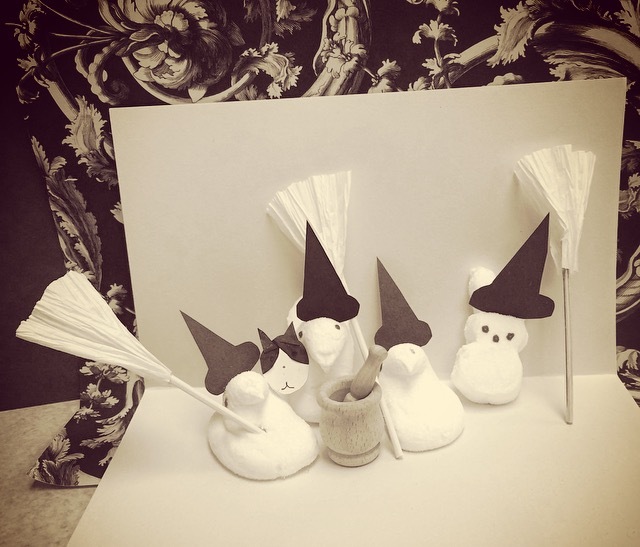 Inspired by other libraries, we created our own peep diorama, complete with cauldron, broomsticks, hats, and a cat to celebrate one of the many great North Carolina school clubs on DigitalNC. A third batch of photos provided by the Oliver Nestus Freeman Round House Museum have been digitized and added to DigitalNC. 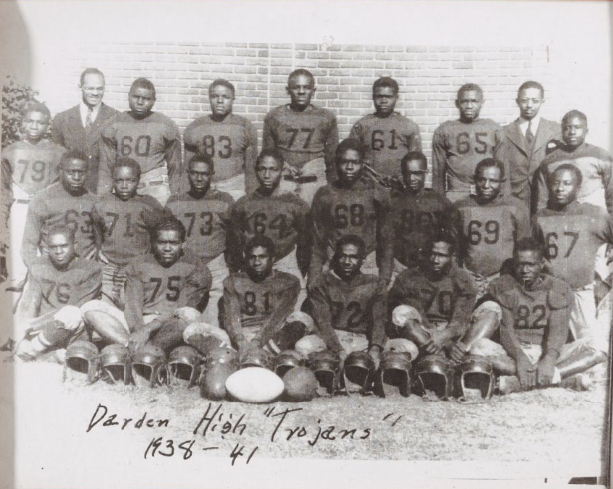 These photographs and newspaper clippings are about the athletes and coaches in Wilson, including teams from Darden High, Speight High School, and Frederick Douglass High School, as well as hall of fame members. The Oliver Nestus Freeman Round House Museum is located in Wilson, North Carolina and has artifacts relating to the contributions of African Americans to Wilson. Past blog posts about items from the museum can be seen here and here. You can view more from the Oliver Nestus Freeman Round House Museum on their contributor page and learn more about them on their website. 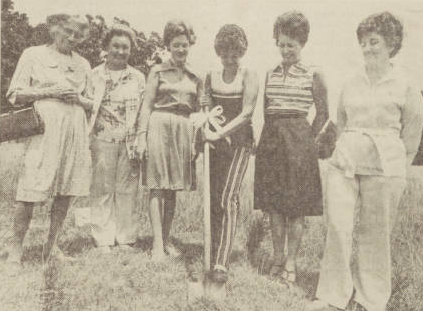 Members of the Woman’s Club in High Point, NC hold a groundbreaking for their new building. 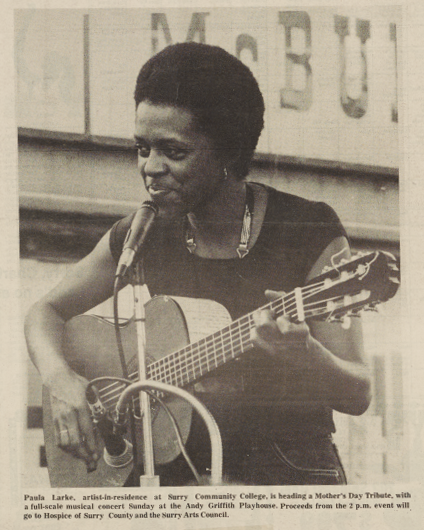 A new scrapbook from Randolph County Public Library has been digitized and added to DigitalNC. The scrapbook contains newspaper clippings from 1970 to 1978. The clippings are about Randolph County, including news articles and photographs about events, clubs, sports, arts, personality profiles, the woman’s club, a library opening, wedding announcements, anniversaries, and obituaries. 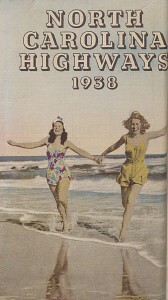 View more scrapbooks, as well as yearbooks and newspapers, from Randolph County Public Library on DigitalNC, and learn more about the library on their website. 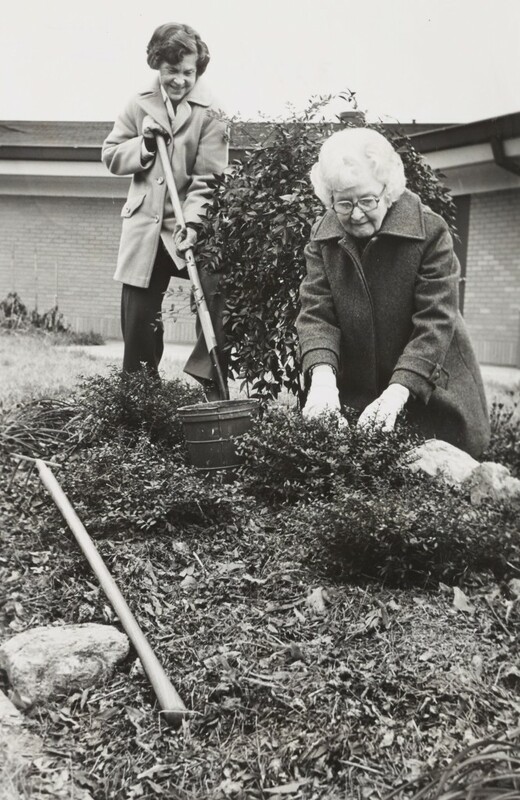 The High Point Women’s Club is connected to the General Federation of Women’s Clubs, which is an international organization dedicated to community development and volunteer service. These scrapbooks from the High Point Museum demonstrate this chapter’s commitment to that ideal. Each scrapbook documents local women’s annual service events like dinners, garden projects, and charity fashion shows (which gives a great depiction of 90’s attire and a group of dedicated women having a great time). They also document local High Point women in state and national leadership positions. To learn more about the High Point Museum, please visit their contributor page or the website. To learn more about the General Federation of Women’s Clubs and its connection to clubs in North Carolina, please visit the organization’s homepage. “Nine Students Jailed,” an article from May 10, 1973 reads. The students were “enacting a social deviance experiment” in order to test “the effectiveness of violence on the college administration.” Click the image to read the full article. New issues from The Salemite have been added to DigitalNC. The Salemite is the Salem College Student Newspaper, continuously published under that name since 1920. Salem College was founded in 1772 in Winston-Salem and is one of the oldest women’s colleges in the United States. The newly digitized issues are from 1970 through 1978. They focus on student life, events, athletics, arts, clubs, announcements, and news. In the image above, students were arrested for conducting a social experiment to see how the school’s administration would react to a riot. You can view all of the digitized issues of the Salem College Student Newspaper, from 1920 to 1990. View more from Salem College here, and learn more about the school on their website. Fifteen new years books from the Granville County Public Library are now available on DigitalNC. These yearbooks feature students and teachers from Epsom High School, Henderson High School, J.F. Webb High School, Oxford High School and the Oxford Female Seminary. 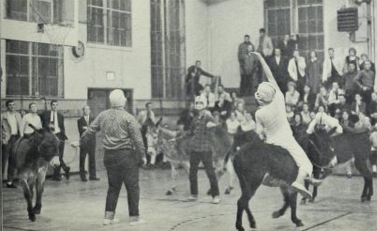 High school yearbooks on DigitalNC often feature interesting, and sometimes weird, traditions. From this batch of yearbooks, Henderson High School sets a new level for interesting traditions. The 1963 “Pep Pac” highlights the high school’s Key Club, which participated in activities to develop leadership skills in young men. 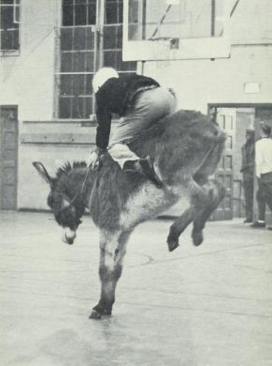 Apparently, one of these activities was a Donkey Basketball game, in the high school gym. It appears that this event was hosted mainly to entertain community members, which it is still doing to this day. Also of interest are the two catalogs from the Oxford Female Seminary from 1883 and 1905. They feature the strict rules and formalities that stand a sharp contrast to the other yearbooks in this batch, which come from the mid-1960s. Each could be useful for someone interested in genealogy of Granville County or Women’s Education in the late 19th to early 20th centuries. To see more yearbooks from the Granville County Public Library, click here. To learn more about the Granville County Public Library please visit the contributor page or the website.